You are browsing the Blog for Eric Menees. This past weekend, Texas Torque took part in the Texas Robotics Invitational, a new off-season event hosted by FRC 3847 (Spectrum). A total of 32 teams attended the competition, including several pre-rookie teams. The main objective of the event was to give local teams some play-time and practice. Texas Torque assisted in this goal by providing one of our one of our bots, Bravo, to the pre-rookie team FRC 9999. The team performed well throughout the qualifying matches, finishing 3rd from from all of the teams participating in the event. Texas Torque was thrilled to invite teams FRC 57 (Leopards), FRC 5287 (Flare), and FRC 4639 (Spartan) to our alliance. Unfortunately, the team lost in the quarterfinals to the first seeded alliance, led by FRC 2468 (Appreciate). 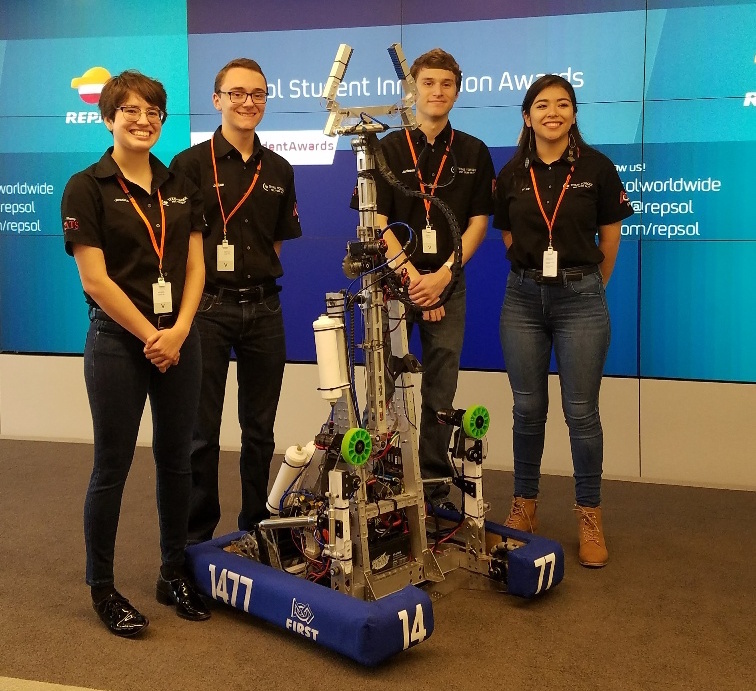 Torque is excited to congratulate FRC 624 (CRyptonite), the alliance captain of the winning team, and its partners FRC 3847, FRC 1429 (KAOS), and FRC 5070 (Gearnotics). Texas Torque would like to thank FRC 3847 for planning, organizing, and hosting TRI this year. We also greatly appreciate the numerous volunteers and Lone Star Regional Committee for making the event possible. Torque also would like to thank our alliance partners for their much-valued efforts. 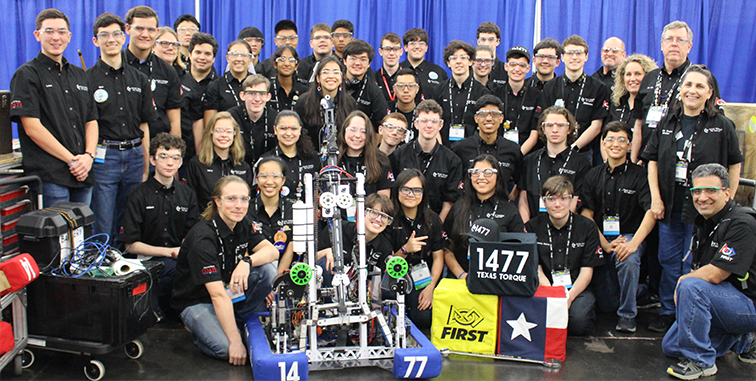 The event was essential to helping us learn and prepare for next season’s regional competitions, and enjoyed seeing our fellow Texas teams hard at work. Overall, this competition was a great experience and was important for fostering close relations with the other teams in our community. We look forward to seeing both our traditional friend teams and the new pre-rookie teams at next season’s competitions! Texas Torque had yet another very successful demo at Comicpalooza, held at the George R. Brown convention center this past weekend. Our team managed to handle the problems that arose well, including the breakdown of both our robots, Sonic and Rev1 by the third day. Saturday, Rev1 was performing well for interested spectators, the team effortlessly awing the crowd. Some of Texas Torque and other teams members played a casual game of lasertag, demonstrating that robotics kids can have lots of fun while they work. Later R2D2 and other robotic celebrities came by to visit their competitive friends and posed for a few group photos. After a long day of running, Rev1 was having some mechanical problems so he stayed home for a repair party while Sonic stepped in and took his place on Sunday. In between speaking about FIRST, operating the robot and fetching frisbees, a few members from Texas Torque and the Robonauts had a game of Mech Corps, Torque ultimately coming out on top while the others easily kept the robot running smoothly. At the end of Day 2, Comicpalooza seemed to be too much excitement for old Sonic to handle and by Monday he refused to run. However, that didn’t stop us. We continued to shoot frisbees as a show and supported the other robotics teams present with batteries and tools. The owner of the batmobile stationed in the convention center came by and was one of the many spectators that Torque spoke to. Impressed with our team work and kindness he invited the teams over to his batmobile where he explained the inner workings of the movie prop and even allowed one of our members to climb inside. Throughout all three days of demonstration, Texas Torque didn’t just show off it’s impressive robot. Torque showed the amazing teamwork it takes to build such a robot, it’s passion in spreading FIRST to a broader community, and it’s ablity to create friendships with other team members outside of Torque, whether it’s through playing lasertag with the Disco Bots, Mech Corps with the Robonauts, or catching frisbees with Spectrum. Torque also advanced within itself where members who didn’t know how were able to learn to drive and operate the robot showing grand potential for the future drive team, ready to lead us to the champs again next season. 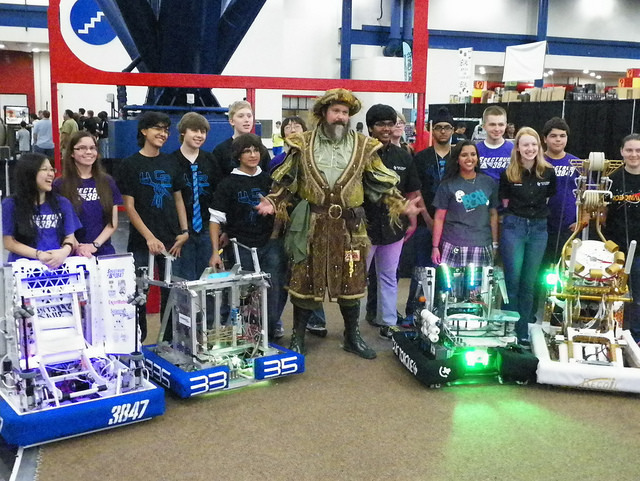 The teams lined up for a group photo with the robots. Texas Torque was delighted to spend July 8th and June 24th at the Wonders of The Woodlands Camp demonstrating our world champion robot, Sonic. Several students went over to The United Methodist Church to help get the word out about STEM and FIRST. Elementary and middle school students who were at the camp had the opportunity drive the robot and learn about electronics and engineering. We were also excited to get some information to students interested in FLL. 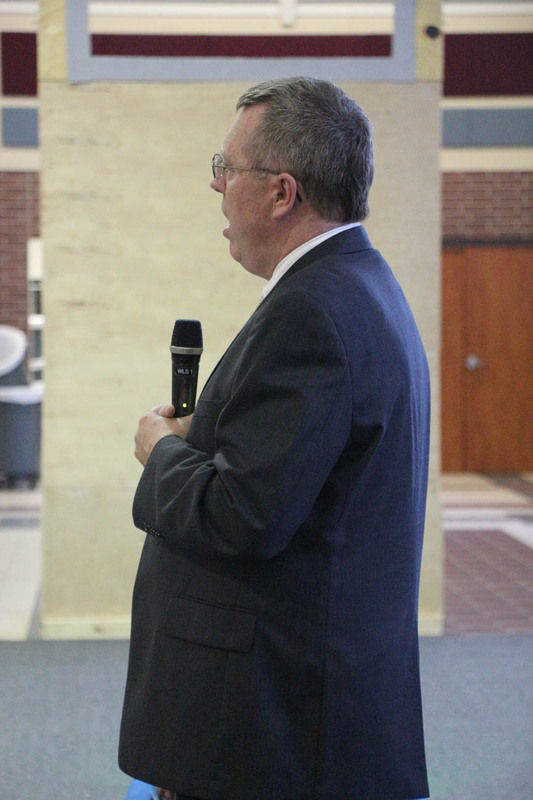 On Tuesday, May 28th, The Academy of Science and Technology honored Scott Rippetoe by holding a reception for his retirement. He has been teaching for thirty years, with twenty two years at the Academy. 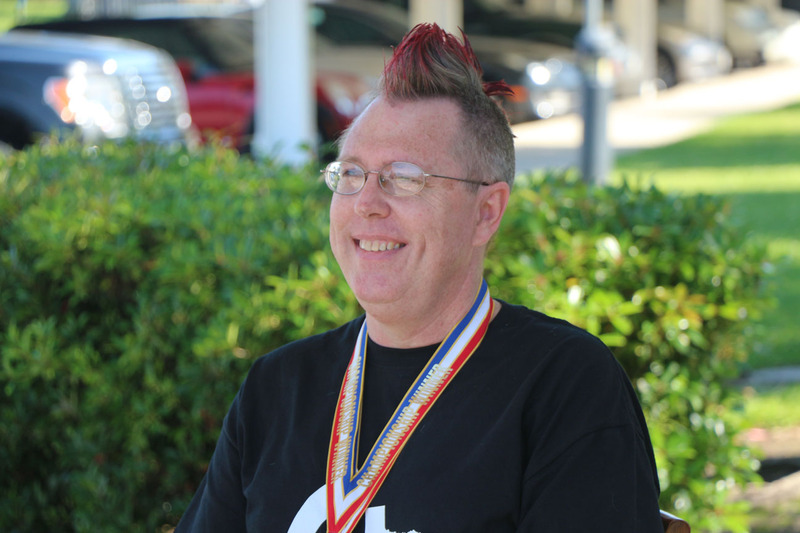 While he will be missed greatly in the classroom, he will continue to affect students through Texas Torque as the official robotics coach in Conroe Indepenedent School District. Events of the night included speeches, presentation of roses, and at the end Mr. Rippetoe took control of the robot for the first time this season, in which he entertained and impressed the crowd. Our team is eternally grateful for all his time spent working for the team, for leading us to the World Championships this year and for continuing his mentorship and friendship with each and every member of the team. We would like to thank Mr. Alan Coats and Halliburton for graciously donating the entry fee that allowed us to compete at the Razorback Regional in Fayetteville, Arkansas. Because of their generous contribution of our entry fee, we were able to take 7 students and qualify for FRC World Championships. Again, we finished qualifying rounds as the undefeated first seed. We chose 1421-Chaos Robotics and 3612- Gear Hogs as our alliance partners and managed to win a regional completely undefeated with their help. We would also like to thank these two teams for creating a strong alliance that propelled us into the final matches. After becoming the winner of the Razorback Regional, we were also honored with the Excellence in Engineering Award sponsored by Delphi. We look forward to competing in St. Louis in two weeks!